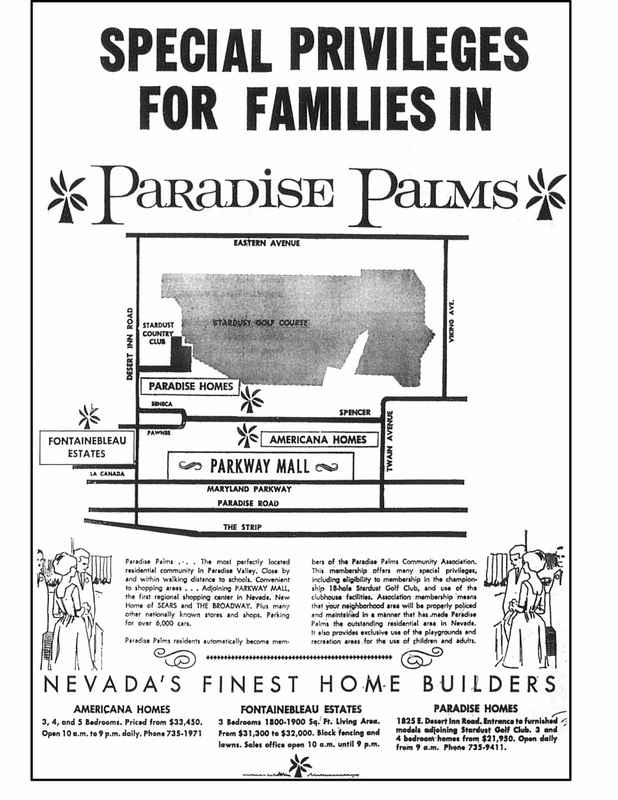 Rediscovered recently from the Nevada State Museum archives are the Paradise Palms community advertisements which approximates where each builder was located. Starting Paradise Palms prices were $21,950 to $41,000 depending on the builder, and topped out at $68,000 for the most luxurious home offered in Tropical Estates. 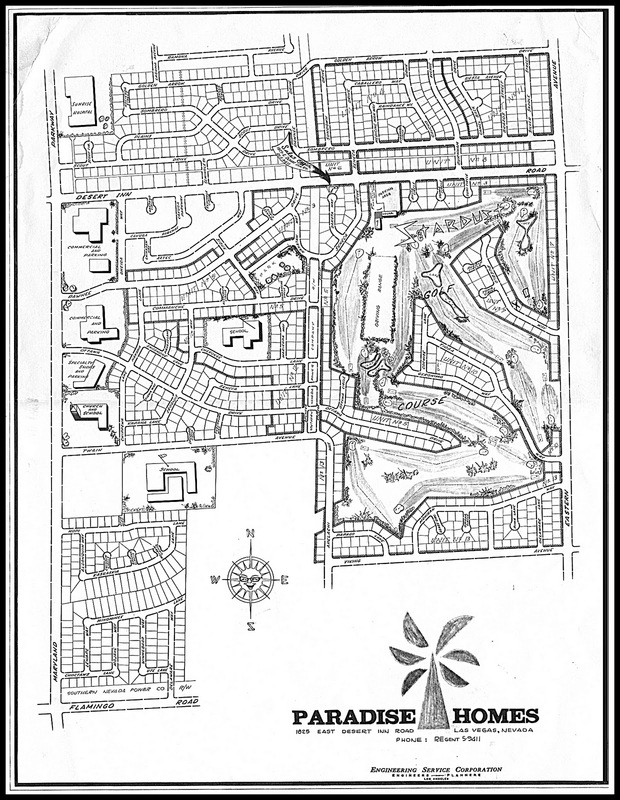 As the map is from 1964, Miranti Homes had finished building on the north side of Desert Inn Road in 1963 and had moved to Paradise Palms West, on Twain Avenue. Valley High School, Orr and Knudson Middle Schools, and Ruby Thomas Elementary Schools hadn’t been built yet – Only Paradise Elementary and Bishop Gorman were noted on the map, the rest were noted as unnamed facilities. The closest shopping centers were Vegas Village and Commercial Center. Commercial Center was built by Paradise Homes – one can still see the signature folded-plate zig-zag roofline at the Las Vegas Cue Club fronting Sahara Avenue that echoes that of the Palmer & Krisel Model 11a and 12a. This second map is from August 1964 – just three builders were left at this time – Paradise Homes, Americana Homes, and Fontainebleau Estates. The Boulevard Mall hadn’t been named yet and was tentatively referred to as Parkway Mall, which was to feature both The Broadway and Sears, along with convenient parking for 6,000 cars. Paradise Palms was humbly noted as ‘The most perfectly located residential community in Paradise Valley’, a description which still holds pretty true to this day. For those who aren't aware, at the time, the unincorporated southeast quadrant of the Valley was known as Paradise Valley – a name which still occasionally pops up on maps or in business names. 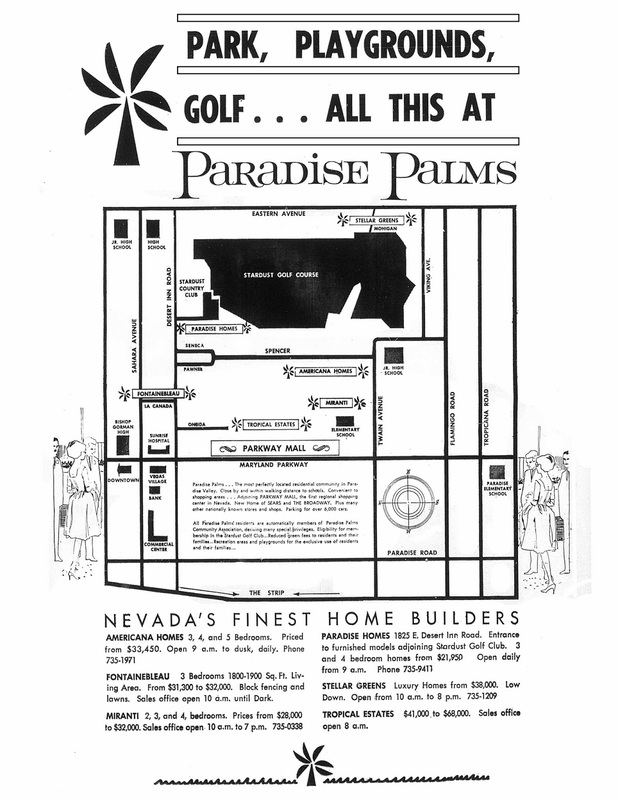 This third and final map was not created by Paradise Palms, but was a general Las Vegas Valley map found in the May 1964 Las Vegas Sun which advertised which builders were building where. 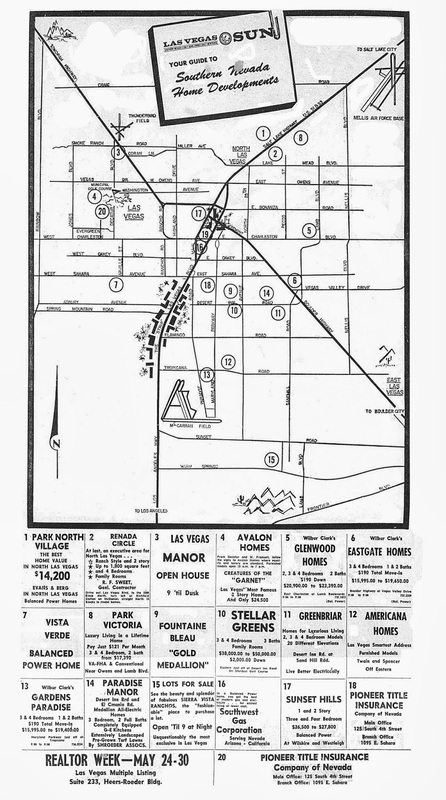 Desert Inn front man Wilber Clark had several active subdivisions under construction at some of the most affordable prices in town - $15,995 for a home at Trop & Maryland or at Boulder Highway and Vegas Valley. The most expensive other than Paradise Palms was Sunset Hills, at Wilshire and Westleigh (Oakey/Decatur) topping out at $27,800. West Desert Inn Road was known as Asbury Avenue, Martin L. King Boulevard was Highland Drive, St. Rose Parkway, formerly Lake Mead Drive, was known as Frontier Boulevard, North Eastern Avenue was 25th Street, Lake Mead Boulevard turned into a road named Miller Avenue, and the North Las Vegas Airport was noted as Thunderbird Field. Interstate 15 hadn’t been built yet, and Las Vegas Boulevard was U.S. 91 & 93.